On the afternoon of Friday, February 26, demonstrators gathered at Whole Foods Market in Santa Cruz, California to protest Driscoll’s, the largest berry distributor in the world with a history unjust labor practices and repression of union organizing. Founded in the Pajaro Valley in 1904, Driscoll’s is a privately held company with headquarters in Watsonville, California. Production of Driscoll’s berries extends into 22 countries. Workers who grow, harvest, and pack Driscoll’s lucrative berries are struggling against the systematic abuses they are forced to endure, and the companies profiting from the exploitation of their collective labor. Demonstrators say they support the farmworkers, including the boycott they initiated against Driscoll’s, and cite poor working and living conditions, as well as growers refusing to negotiate with the workers’ unions: Familias Unidas por la Justicia (FUJ) [Families United for Justice] in Washington State and the Sindicato Independiente Nacional Democrático de Jornaleros Agrícolas (SINDJA) [National Democratic Union of Independent Farmworkers] in Baja California. The union SINDJA is called La Alianza (The Alliance) for short. Gardeners seek a creative solution to preserve twenty five years of cultivating food and culture in the heart of the Santa Cruz Beach Flats. 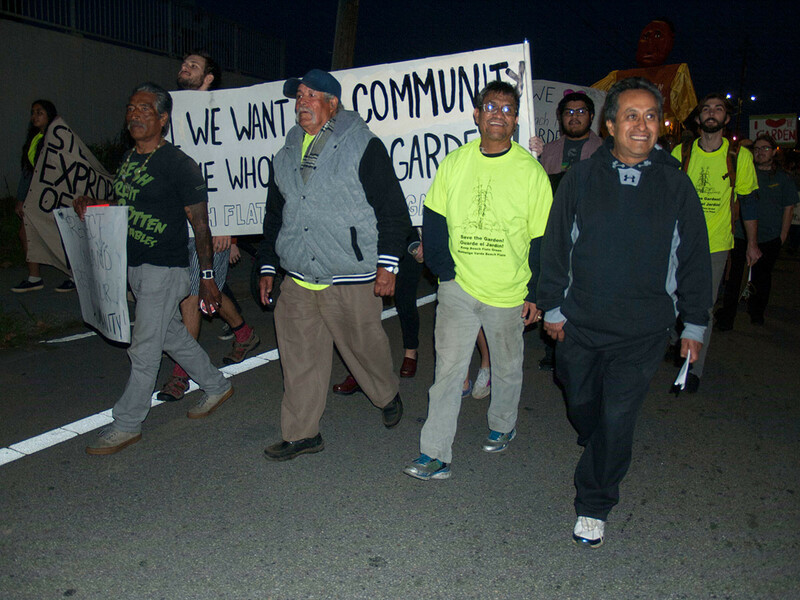 On February 9, hundreds of people marched through downtown Santa Cruz from the Beach Flats Community Garden to the city council meeting. Gardeners, along with a large coalition of supporters, are seeking a creative solution to preserve twenty five years of cultivating food and culture in the heart of the Beach Flats. Over the past year, the gardeners have asked for community support, and when 4,000 people signed a petition and 200 people showed up to a city council meeting last fall, the city agreed to attempt to negotiate a sale with the owners of the property, Seaside Company, who also own the Beach Boardwalk and much of the rest of the Beach Flats neighborhood.